Durham Road Baptist Church is based in Gateshead and has been around for 142 years. It has a rich and interesting history: having been planted out of the baptist church in Newcastle in 1877 it grew to be the beacon of evangelical truth in the North East. From the 1960s and 70s onwards it experienced significant decline. The building of the motorway cut the church off and many people were relocated when their homes were demolished. 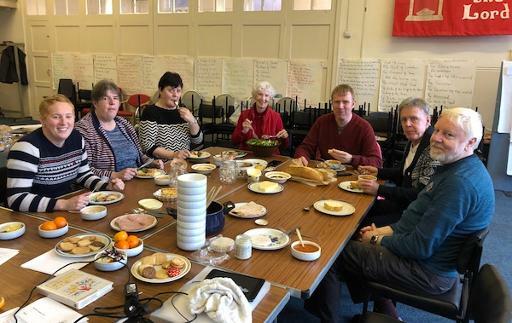 The church dwindled to about 20 people, although it is still connected to an enormous social network in Gateshead with many people having been married, baptised and taught Sunday school at the church. Duncan arrived as the new minister in summer 2016 and over the last few years God has graciously brought people of all different backgrounds. There are now about 50 people on Sunday morning from pool of about 80 and our diverse congregation is made up of retired Geordies (about 15), African families (about 12), people in their 20s and 30s from the Middle East (about 25), some students and graduates and a handful of others. The church is in one of the poorest areas in the North East and there are challenging issues of health, poverty and social deprivation. We currently have 6 refugees who are destitute as they have no leave to remain and no support. There are challenges, but also wonderful opportunities to make God's love known in a practical way and to be a blessing to the wider community. The vision is exciting and big. My prayer is that you'd like to support me as I play my part in it. My passion is for mission and for equipping God's people to be disciples who make disciples so that whole communities come to know and follow Jesus. Read more about what I get up to on a weekly basis on the what I do page.